White Cane History: In 1921, James Biggs, a photographer from Bristol, England, became blind following an accident. Because he was feeling uncomfortable with the amount of traffic around his home, he painted his walking stick white to be more easily visible. In 1930, the late George A. Bonham, President of the Peoria, IL Lions Club introduced the idea of using the white cane with a red band as a means of assisting the blind in independent mobility. The Peoria Lions approved the idea, white canes were made and distributed, and the Peoria City Council adopted an ordinance giving bearers the right-of-way to cross the street. 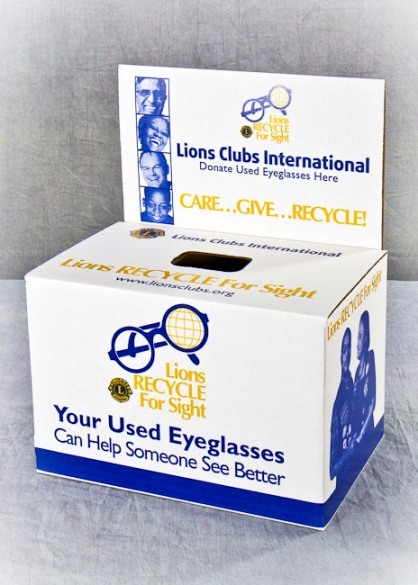 News of the club's activity spread quickly to other Lions clubs throughout the United States. Today, white cane laws are on the books of every state in the U.S. and many other countries, providing blind persons legal status in traffic. The white cane now universally acknowledges that the bearer is blind. Tennessee School for the Blind Serves Pre-K-12 students who are blind and visually impaired from all across the State of Tennessee. TSB provides information, education, counseling and technical assistance to families as well as children. The Lions Tennessee School for the Blind Fund provides a student work program, a low vision assistance program, summer enrichment programs, funding for Boy & Girls Scouts, and a personal gift to each student at Lions Day At TSB the second Friday in December. Leader Dogs for the Blind A non-profit organization in Rochester, MI. dedicated to providing the means for safe and independent travel of the blind. Over 12,000 Leader Dogs have been trained in obedience, in dealing with traffic and confusing situations such as crowds or revolving doors. As many as 300 students a year enroll in the 25 day live-in program free to the student. Breeding and puppy programs, GPS and computer skills are also available. Middle Tennessee Lions Sight Service Provides financial assistance to people in Districts 12-I and 12-S, who do not qualify for other resources, in obtaining vision related medical treatment in designated hospitals. They must be sponsored by a Lions Club and accepted for service by MTLSS. There is a special account for children from birth to age 18 and another for Low Vision assistance. Ed Lindsey Industries for the Blind, Inc A sheltered workshop employing around 50 blind adults and some sighted people for tasks more detailed than the making of chin straps, mops, and brooms, the last two of which can be purchased by Lions Clubs at a special rate for fund raising. There is also a Thrift Store on site. Lions World Services for the Blind A rehabilitation center in Little Rock, AR to teach independent living or job training skills. Includes a personal adjustment center for those with adult onset of blindness, vocational training, job placement assistance and a college prep course. Recordings for the Blind and Dyslexic National non-profit education library for people with print disabilities. The studio in Oak Ridge, TN records mostly educational material for students in kindergarten through graduate school. Tennessee School for the Deaf Serves K-12 students from all across the state of Tennessee. The School provides a total learning environment that utilizes state of the art curricula, materials and methods for the purpose of preparing students for adult life. Lions contributions are the primary source of funds for the TSD Benevolent Fund and the TSD Summer Camps that serves deaf and hard of hearing students that attend either TSD or other programs in Tennessee. Our club meets the 2nd and 4th Thursday at 8:00 am to 9:00 am at Elliston Place Soda Shop at 330 Mayfield Drive in Franklin, TN if that location and time works better for your recycling effort. This meeting location is near the corner of Carothers Parkway and Mayfield Drive. Thank you for your donation.